John was born the third son of Rhonda and Harry, in Whangarei on December 1, 1954. He was educated at St Mary’s Primary from 1960 to 1965. His family then moved to Auckland, and John finished his primary schooling at Marist Sisters School, Mt Albert. In 1966 he went to St Peter’s, completing the seventh form in 1972. From there he went to Otago University for three years endeavouring to do a medical degree but changed to unsuccessfully complete a degree in microbiology and immunology! He laboured in various jobs, factories, DYC, and so on. He then moved to Sydney in 1977 but lack of work forced him back after 10 months. He started a lawn mowing round of 26 lawns, as well as shift work at DYC. In 1978 he moved to Melbourne, living in the South Melbourne area. He had problems getting a job in the laboratory field, so opted to do a manager’s course with KFC. John quickly rose to a manager and then on to Area Manager with several stores under his care. During the latter part of this job, in 1984, he was diagnosed HIV positive. In 1985 he and John Matson opened “The Sandwich Surgery” in the London Mall in central Melbourne. This was a very good business with intense work required. They sold and dissolved the partnership voluntarily in 1986. Then in 1987, he bought a Red Spot Chicken store in Melton, about 45 km out of Melbourne. Unfortunately, this business was not successful for various reasons, ending in bankruptcy in 1988. There was much trauma as a result. John drove a taxi in the evening to recoup the money, but his health deteriorated, developing into AIDS in February 1989. He returned home to New Zealand in December 1989 and was nursed by his family until he died May 6, 1990, at the age of 35. 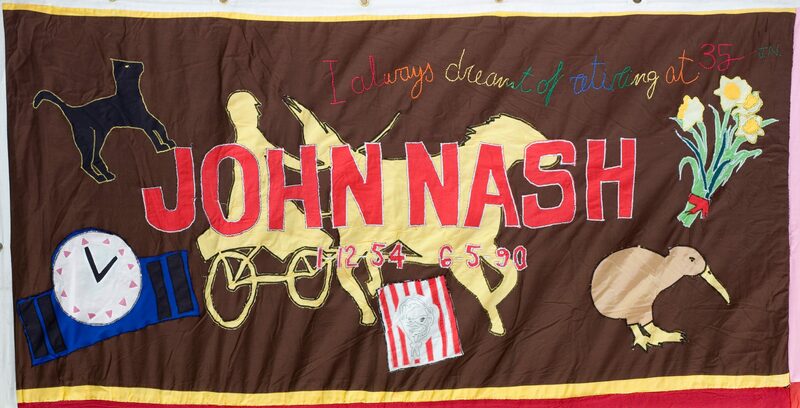 John’s whole life revolved around racehorses and racetracks from an early age. He had shares with two others in a trotting horse called “Trio’s Risk”. He won them five or six races before breaking down. John had several old clocks of which he was very proud. He loved daffodils, of which he grew many in pots. Everyone seemed to flower for him. Yellow for friendship, he said. The Kentucky Fried Chicken emblem of his workplace. The kiwi, of which he was always proud. Strangely enough, for many years John said he planned to retire at 35. A lovely memorial created by John and Charlie, of which they have another on the Melbourne Quilt. Neither of these guys had used a sewing machine before.